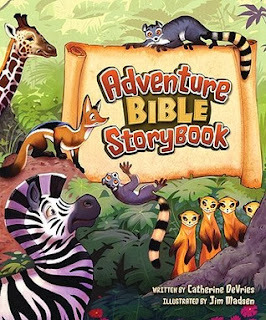 This storybook Bible for kids ages 4-7 will start them on a journey of discovering about the Bible and growing with God as they grow up with the Adventure Bible, at every age and stage, beginning with the Bible Storybook and continuing on through age 12 with the NIV edition. 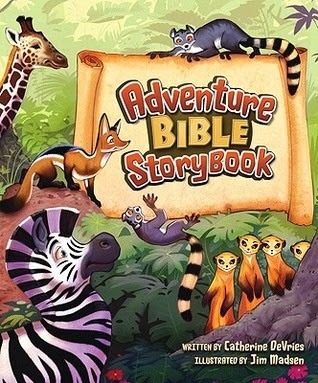 At every twist and turn, the Adventure Bible Storybook is filled with---what else---ADVENTURE! Parents and loved ones can be assured that children who read it will learn the main stories and themes from the Bible, but all within a fun, exciting theme of discovering, imagination, and suspense---everything you'd expect from a fantastic adventure. This storybook includes some lesser known stories that are particularly adventurous, such as Paul's shipwreck on the island of Malta, and when the Israelites went to spy on the people of Canaan. My thoughts: First, can I just say that I love my job? The fact that I can get items like this for free for our Bug just blows my mind! This Bible set is just gorgeous. The pictures in this book are so vivid, so colorful. It is perfect for children! The stories are simple enough for children to grasp and ponder. I love that there is an equal mix of Old Testament and New Testament stories. The audio CDs are a huge bonus! Jason is an avid audio book listener. I never have been, but am considering it, and I think Bug will enjoy both reading and listening to stories. The audio CDs are perfect for listening to while you're working on something else - I can imagine her playing these while falling asleep in bed, helping make dinner or playing in the living room. I'm so excited for her to grow up with this set! If you're looking for a simple Bible set for your little, this would be absolutely perfect. You won't be disappointed! Thanks to booksneeze.com for providing me with a copy of this book in exchange for my honest review.